Pam Allyn is a world-renowned literacy expert, author and motivational speaker. She is the Founder of LitWorld and LitLife, a cutting-edge education consulting group specializing in professional development for PreK-12 literacy instruction. In May 2007, The Children's Village presented Pam with its Legacy of Service Award for bringing books and reading to children. She received the 2013 Scholastic Literacy Champion Award, and is Scholastic's Open a World of Possible Ambassador. She is a spokesperson for BIC Kids, championing BIC's "Fight For Your Write" campaign. In April 2014, she was chosen as a W.K. Kellogg Foundation Fellow in Racial Equity and Healing, a three year initiative to support recognized equity leaders in their work on the ground. She was selected as a mentor for the 2013 Bush Institute's Women's Initiative Fellowship to help young Egyptian women develop leadership skills. She was recognized as a finalist for the 2017 Brock International Prize in Education. Pam is the author of 26 books for educators, leaders and families on reading, writing and quality learning. Her most recent book is Every Child a Super Reader (Scholastic, 2015), co-authored with Dr. Ernest Morrell. Other books include Your Child's Writing Life (Avery, 2011), What To Read When (Avery, 2009), and Pam Allyn's Best Books for Boys (Scholastic, 2011). She has written and contributed to a number of curriculum and instruction books, including the Core Ready series (Pearson, 2013), the Complete Year series (Scholastic, 2008) and Homework Pages for Independent Reading (Scholastic, 2013). Pam is featured widely in traditional press and on social media as a literacy expert for both home and school. She has been featured on Good Morning America, The Today Show, NBC News, Oprah Radio, The Huffington Post, CNN International, Al Jazeera and in The New York Times, speaking to the power of education and literacy to transform lives and to create gender and racial equity. Kisha joined us as a summer intern in 2016, soon after she graduated from Washington University in St. Louis with a degree in International Development. She comes to the LitWorld team with international, research and communications experience from internships at her university and from her work abroad in Tanzania and Nigeria. She was drawn to LitWorld's commitment to supporting the imagination and agency of children everywhere, and she herself has recently rediscovered her childhood love of reading. She is now a proud member of the not-so-secret club of New York City's subway readers. Jennifer joined the LitWorld team shortly after its founding in 2008. She began as the Executive Assistant and moved into program development and management as LitWorld grew into a leading organization in literacy and social-emotional education and advocacy. She is a passionate advocate and educator who has worked with children and youth in communities throughout North America, Europe and Africa. After receiving her MSc in International Education from Oxford University, Jennifer returned to LitWorld to lead this strategic expansion initiative in partnership with Global G.L.O.W. Global G.L.O.W. is a California-based nonprofit focused on mentorship for girls. Jennifer is jointly employed by LitWorld and Global G.L.O.W. and divides her time between the New York and California offices with her primary base in New York. Jodi is a recovered lawyer who practiced in DC and NYC until she realized she no longer loved it and found a way to channel her skills into serving non-profits with youth missions. Her development work has focused on strategic gala planning and cultivation of sustainable corporate and individual partnerships. She is also PTA President of a public school that relies exclusively on fundraising for enrichment programming. Jodi has a BA from Duke and JD / LLM from GW Law. She lives in Brooklyn with her husband, sons and dog. When she’s not rabble-rousing grown-ups for money or chasing her brood around, she practices as much yoga as possible, runs circles around the park (and the occasional half marathon), experiments in the kitchen, skis, and travels. And when it's finally time to sit, she opens a bottle of port and a book. Dorothy joined the LitWorld team in 2009 with a focus on web, video, and graphic design exploration and communications. She co-created World Read Aloud Day in 2010, which now has millions of participants in over 100 countries every year. Dorothy now manages strategic partnerships, planning and design for LitWorld and the HerStory Campaign. She first worked with Pam Allyn in her Books for Boys program, mentoring boys through reading and writing at the Children's Village while she was an undergraduate student at Amherst College. Dorothy grew up working behind the scenes with her parents at their Mettawee River Theatre Company in New York City and upstate New York and continues to contribute to their work. She is currently in the Executive Masters Program in Change Leadership at Teacher's College, Columbia University. Dorothy lives in Brooklyn, NY with her husband Doug, a musician and web developer, and their inquisitive daughter Joan. Amber Peterson joined the LitWorld team in July of 2015. She holds a Bachelors Degree in English Literature, Geology and Theater Arts from Oberlin College, and a Masters in Education from St. John's University. Before joining the LitWorld family, she worked for seven years as a middle school english language arts and social studies teacher in New York City, and taught English as a Second Language for two years in Tokyo, Japan. She loves travel, theater, and science, and is a passionate advocate for global literacy and educational equity. 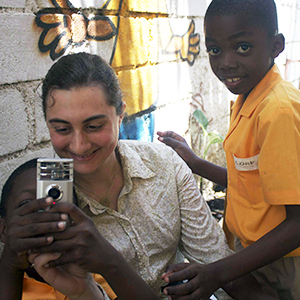 Anxhelina joined LitWorld in 2017 as Director of Operations and HR, after her involvement with the LitWorld Young Professional Group and observation of LitClubs in Haiti. Born and raised in Albania, she brings to LitWorld eight years of professional leadership and both international and domestic program management experience. Previously, she worked in social services program management for individuals with developmental disabilities and managed education programs, grant management and community outreach efforts for organizations in NYC, India and Albania. At her core, Anxhelina is a facilitator with a passion for operations management, who enjoys challenging and impactful work that strives to make a difference in the community. In her free time, she enjoys learning languages, traveling, volunteering and mentoring youth social innovation programs with The Resolution Project. Emma has a background in international studies, communications, and has worked with various nonprofits to effect measurable change. She received her Bachelor of Arts from University of Wisconsin – Madison, where she double majored in Spanish and Latin American Studies. Emma keeps up to date on the latest digital tools to find the best platform for every story, whether it's 140 characters or a 2-minute video. When she's not working, she loves exploring her new neighborhood, planning world travels, and attempting to incorporate more vegetables into her cooking. Ana joined LitWorld in 2013 as the International Program Director. She oversees the management and expansion of LitWorld's international work. Ana brings a lifelong commitment to working with and for children throughout the world. Starting her career in the New York City public schools and after-school programs, Ana expanded her work to Brazil, Guatemala, and India before joining LitWorld. Ana spent three years in India at the Akanksha Foundation in Pune, India, where she managed the after school programs at a local organization that worked to provide innovative English language learning opportunities for marginalized children. Ana grew up in New York City and attended New York University, where she received both her bachelors degree in elementary education and her masters degree in public administration. When she isn’t working with LitWorld, Ana enjoys riding her bike to work, dancing, and learning new languages. Monica joined the LitWorld team in 2017. She has a degree in Psychology with minors in Education and Women's Studies from Colby College in Maine. She spent her nonacademic time working for the theater department, in a third-grade classroom or tap-dancing on a rug in her dorm room. Upon returning to New York City, she spent a year working as a social worker with high-risk adults in the Bronx. Now she spends much of her time exploring her neighborhood in Brooklyn, cooking and listening to podcasts. Juliana has a MS in International Development & Humanitarian Assistance with a specialization in Gender Studies from NYU. For her thesis she combined her passion for participatory education and girls’ rights and developed a skills-building curriculum for adolescent girls in conflict and post-conflict urban settings. Before joining LitWorld, she was coordinating a variety of climate justice programs for an environmental women’s rights INGO. She is now jointly employed by LitWorld and Global G.L.O.W. and manages HerStory Campaign projects. Juliana is originally from Colombia, South America and in her free time she loves to travel, enjoy the outdoors, watch soccer, and read.